We live in an age where globalization gives us access to the best foods all year round. While there are many great food options to choose from, there are some foods that are way better than others. Why eat mediocre foods when you can consume superfoods easily! Gram for gram, superfoods are able to nourish and provide you with much more vitamins and nutrients than average foods. Unlike Snapple, they are truly some of the best stuff on the planet. These 5 superfoods are so common, and so easily accessible, you should have no problem consuming them on a daily basis. You’re probably familiar with all 5 of them. Avocados are by and large one of the healthiest fruits on the planet. Not only do they taste great, they go well with many dishes and are packed with a ton of nutrients. Some of the healthiest fats available can be found in avocados. Stop listening to the media. You need fat in your diet. Especially the healthy unsaturated fats that you can get from this superfood. 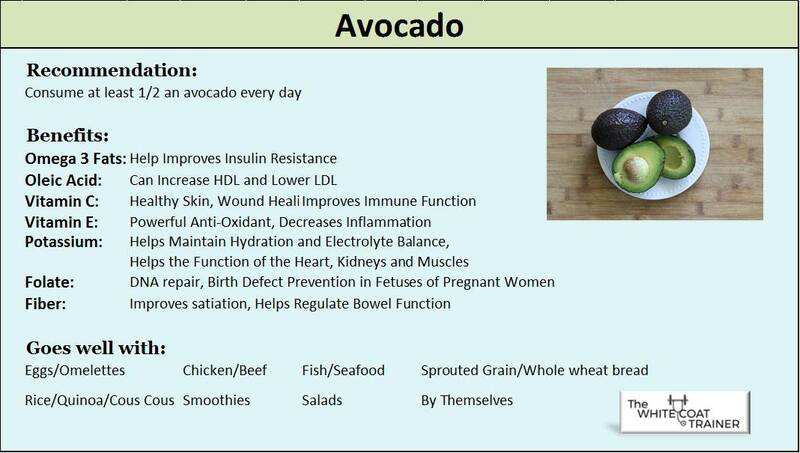 The fats in avocados can help improve insulin sensitivity and improve your cholesterol levels. They are also jam-packed with Vitamins C and E, and other nutrients such as Potassium, Folate, and Fiber. Given their neutral taste, avocados go well with numerous dishes. You have no excuse not to eat them. While avocados are technically berries, it is still beneficial to consume the other traditional berries. 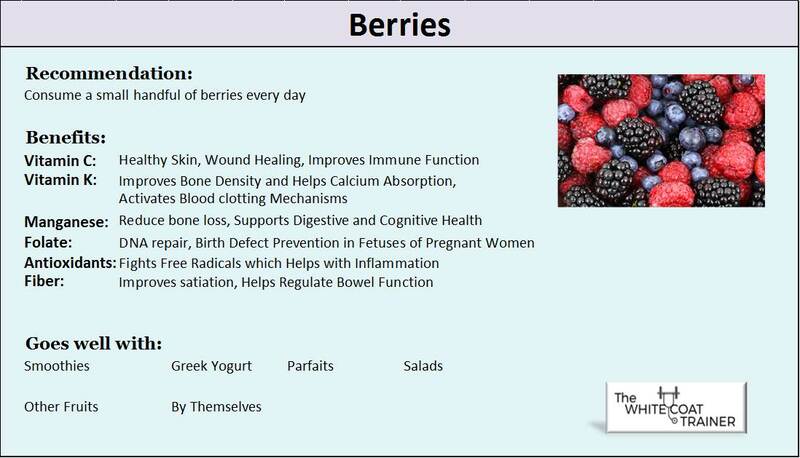 The berries that you need to consume include blueberries, raspberries, blackberries, and strawberries. Berries taste great and are an excellent way to satisfy a sweet tooth. They have a very low glycemic load and are packed with Vitamins and anti-oxidants. They also contain Manganese which helps fortify your bones and improve cognition. Try to mix and match these four berries as much as possible and in as many dishes as you can. They go really well with yogurts, parfaits, salads, and smoothies. They are also great all by themselves. Nuts are another fat containing superfood. They are probably one of our favorite foods of all time. The high fat and high protein content of this superfood will keep you full for a long time, making it the best possible snack in a pinch. They are also extremely portable. Peanuts are technically a legume and not part of the nut family, but all other nuts are fair game. Almonds, Cashews, Walnuts, Pistachios, and Brazil Nuts. Mix and match between all of the nuts to get a variety of minerals that are exclusive to each nut. We get a huge container of mixed nuts and pack them into zip lock bags to have ready to go. Another great option is nut butter. Peanut butter, Almond butter, Cashew butter etc increase the versatility of nuts, allowing you to mix it with fruits, yogurts, smoothies, and shakes. 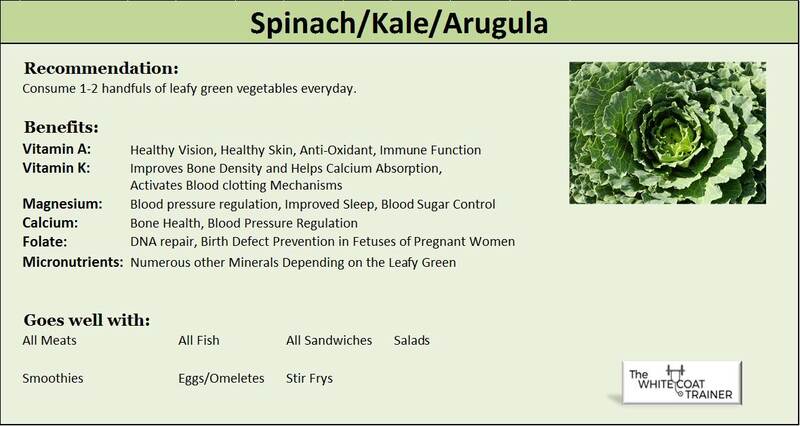 Every single person on the planet knows that leafy green vegetables are good for you. This is an understatement. They are really, really good for you. Leafy greens are probably the healthiest food of all time. The vitamin and mineral profile on these are outrageous. They are high in Vitamin A and K, Iron and Folate, but also in Magnesium (Mg). Many people are deficient in this key mineral that has a lot of benefits, particularly blood pressure regulation and improving your sleep. You can mix and match the three options listed: spinach, kale, and arugula. Leafy greens can be added to just about any dish making them extremely versatile. Make sure to freeze them when you buy in bulk, as they do tend to go bad relatively quickly. Consume 1-2 handfuls of leafy green vegetables every day. This last one is pretty obvious, but everyone still needs constant reminders. 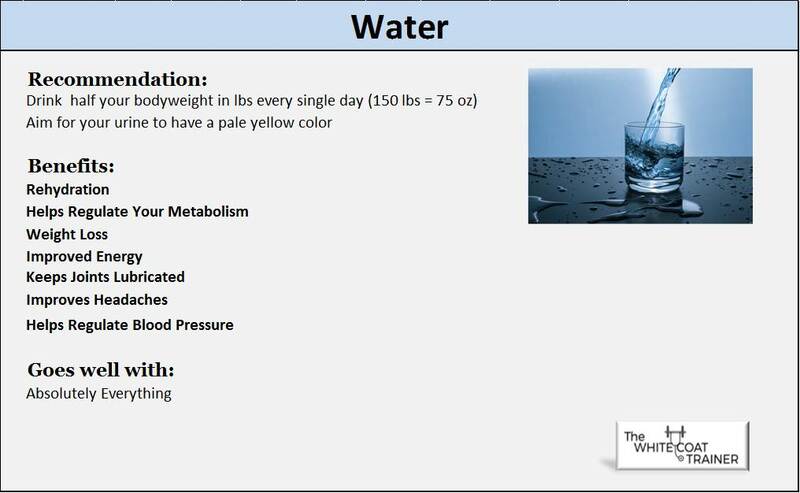 Water is necessary for every metabolic reaction in the body. It is by far the healthiest drink on the planet. Far too many people live in a dehydrated state due to all of the non-water beverages they drink throughout the day drinking. If you are thirsty, it’s too late. Your body is already dehydrated. Dehydration can lead to fatigue, vasoconstriction, (high blood pressure), poor sleep, muscle cramps and joint pain. Also, please do not say that you don’t like water. We are made up of 60-70% water. It is necessary for your survival. Stop drinking beverages with added sugars or artificial sweeteners- they will never replace water. For an added bonus, you can add a tiny pinch of sea salt to your water to hydrate quickly. Consuming these 5 superfoods every day will provide you with plenty of health benefits. Even if you cannot give up some of your vice foods, make an attempt to add in these amazing superfoods to your regular meals. Find creative ways to mix and match them into your daily routine. You will begin to feel better. Guaranteed. 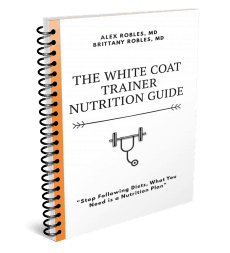 Besides drinking a lot of water on a daily basis, there are a few other strategies that you can use to improve your diet regardless of how busy you are. Check them out at 7 Simple Ways to Eat Better Immediately. Are you consuming any of these everyday superfoods? What else would you add to the list? I’m one of the few people on the planet that seems to dislike avocado. It is a good one but they are very calorie dense like nuts and see people get carried away with them. Your portion recommendations look great though. Black beans are one of my favorite "superfoods". High in fiber and protein. I agree, avocados can be calorie dense just like nuts but the great thing about em is that they are difficult to overeat in their natural state. I.e. not many people would eat a whole raw avocado. Its when we start to modify the foods, such as making avocado into guacamole or roasting nuts and adding sugary coatings that its easy to get carried away with them. And yes, I love legumes. I try to rotate them every week to get the different benefits. Avocado and berries are my favorite!! I always forget about the nuts though, but at least I do drink a lot of water.